we then headed up to Marin County to rest our tummies before heading to Napa on Monday night. 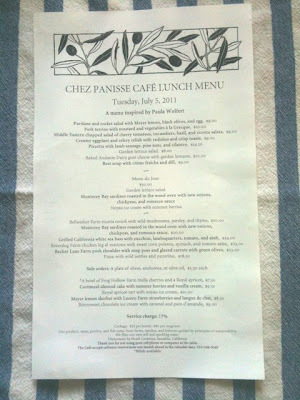 on our way back to LA we had lunch at Chez Panisse and I thought of you + Alice + David as I savored each and every bite - i had the rocket salad, the chicken and finished with the apricot tart with ice cream....pinch me. don't you worry doll... we are going to re-visit your culinary adventure here again over a FEW days not ONE. in the meantime, enjoy your amatriciana birthday meal at the boys tonight. p.s. was very sad on the ride back to hear our lovely Cy has left us.